Honda has stayed away from the 250-500 cc segment of the Indian market, and except the CBR250R, the Japanese two-wheeler brand has not had any product in the category, yet. After commencing the bookings last month, Honda Motorcycle and Scooter India have launched the new CB300R at an ex-showroom price of INR 2.41 lakh. In this post, we would list all the details and features that you should know about the new 2019 Honda CB300R. The Honda CB300R is brought into the country via the CKD route, and yet the motorcycle retails at a competitive price tag of INR 2.41 lakh. Honda is currently bringing the motorcycle via the CKD route. 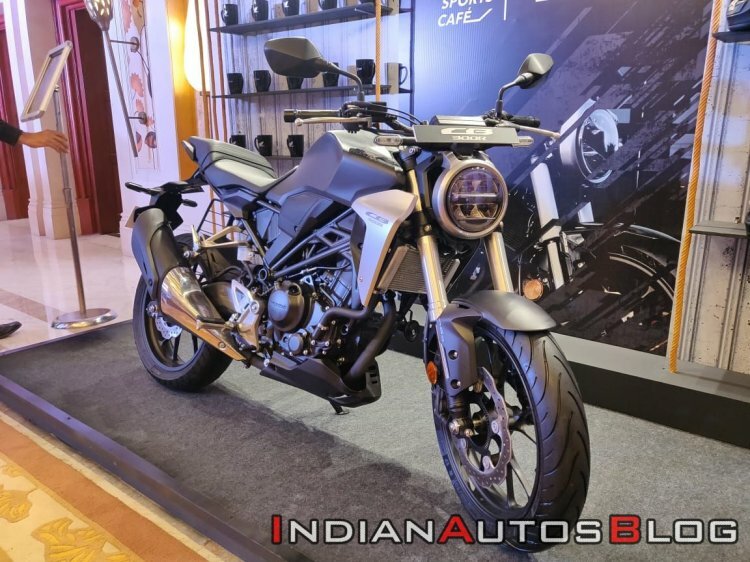 The bike has been placed against the KTM 390 Duke in the Indian market although, at the ex-showroom price point of INR 2.41 lakh, the retro-style CB300R would face some competition from the Royal Enfield 650 Twins. The ex-showroom prices for the Royal Enfield Interceptor INT 650 start from INR 2.50 lakh while the Continental GT 650 is available from INR 2.65 lakh. The KTM 390 Duke retails for INR 2.44 lakh. The motorcycle may face some competition from the BMW G 310 R although the Indo-German naked roadster is priced at a premium and retails for INR 2.99 lakh. Visually, the bike draws styling cues from the Neo Sports Café design theme of the CB1000R and comes equipped with features like full LED lighting (headlight, tail light and blinkers), and a digital instrument console among others. The headlamp gets a two-bar light feature while the tail light is the thinnest ever unit on a Honda motorcycle. The full-digital display shows the speedometer, tachometer, fuel gauge and gear position. The telltale indicators sit on top of the digital screen. The motorcycle follows 'modern and minimalist' theme and thus features minimal body panels, thus revealing the pressed and tubular steel frame and the 296cc single-cylinder motor. The dual chamber exhaust isn't the slimmest in the segment, but it merges well with the overall design. The chiselled fuel tank lends a muscular persona to the CB300R while the shrouds further enhance the beefy look of the motorcycle. The fuel tank capacity of 10-litre should offer a decent range between fuel stops. The tank is followed by a split style, step-up seat. The pillion grab rail is neatly integrated into the design to give the motorcycle a clean look. The engine cowl adds a sporty look to neo-retro styling. The premium hardware setup on the motorcycle includes upside-down telescopic forks at the front and a 5-step adjustable monoshock suspension at the rear. Steering duties are performed by flat, single-piece handlebar. The handlebar features a radius of 40-degree while the turning radius stands at 2.3 meters. Stopping power comes from a 296 mm single petal disc at the front and a 220 mm single petal disc at the rear while the safety net of dual-channel ABS comes as standard. The India-spec Honda CB300R uses Michelin Pilot Street Radial tyres. At the front is a 110/70-R17 section tyre while at the rear is a 150/60-R17 unit. 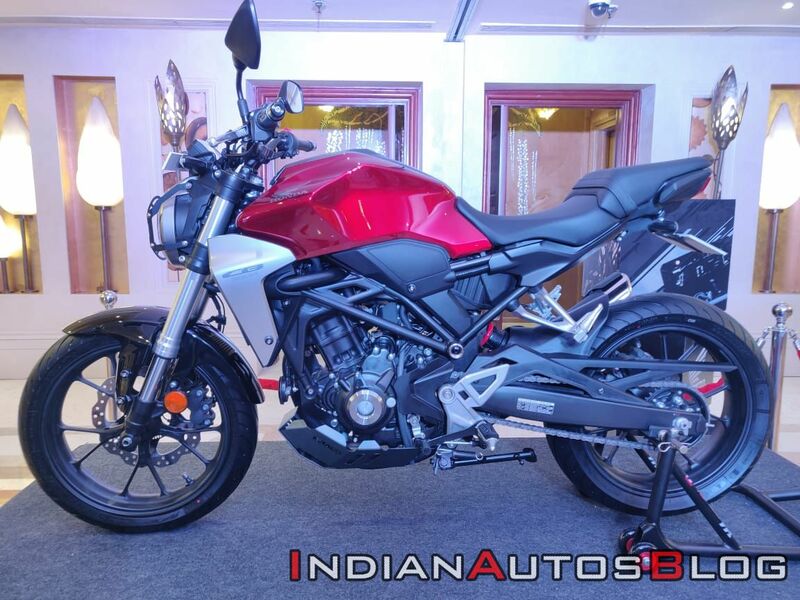 The motorcycle would be available in two colour options in India – Matte Axis Gray Metallic and Candy Chromosphere Red. The Honda CB300R draws power from a 286 cc liquid-cooled, DOHC, single cylinder fuel-injected motor that puts out 30.9 bhp of power at 8,500 rpm and 27.5 Nm of peak torque at 7,500 rpm. The engine is paired with a 6-speed gearbox. The motorcycle, as seen in a YouTube video, accelerates from 0-60 km/h in less than 3 seconds and from 0-100 km/h in 6.20 seconds. In comparison, the KTM 390 Duke accomplishes the same in 2.6 seconds and 5.5 seconds respectively. The Honda CB300R will be sold via the company's Super Bike dealership network and you can find the complete list in the table below. Honda will be selling the CB300R via its Super Bike dealer network, and thus there are limited places where you can go and book one for yourself. Honda claims to have received a positive response for the CB300R, and the motorcycle is said to have booked for over three months.